If you are getting ready to graduate, you may just now be facing the reality of the amount you borrowed to attend school. If you took out private student loans in addition to the federal student loans you may be in an even more difficult situation. There are strategies you can employ to reduce your monthly payment, but you will need to pay the loans for an even longer period of time. It is important to be as proactive as possible. You may not be able to afford a lavish lifestyle for a several more years as you work to pay off your degree. There are several options available to you when it comes to paying back your federal student loans. The Federal government just announced income-based repayment options that allow you to reduce your monthly payment based on your current income. It will adjust as your income adjusts and after making on-time payments for twenty-five years you can have the remaining balance of your loan forgiven. The Pay as You Earn program is similar, but it offers even more help with your loans. Another option is to consolidate your federal loans and lengthen the amount of time you have to repay the loan. The consolidation option will decrease your monthly payment, but you will end up paying more in interest over the life of your loan. This option may make it easier to manage your current financial situation, particularly if you do not qualify for income-based student loans. You also lock in an interest rate with your student loan consolidation. If you want to qualify for a loan forgiveness program, you need to consolidate into a Federal Direct Loan. Consolidation can lock in your current rate and prevent your student loan interest rate from going up. Additionally, you can work with your lender if you have a difficult time finding a job or if you lose your job. The federal government will allow you to defer your payments if you lose your job or if you are faced with a difficult financial situation. You will need to document your situation and turn in proof of your situation. You cannot simply stop making payments, you must call and ask to be put on deferment and complete the application to qualify. Private student loans have a higher interest rate and will not be as flexible on changing your payment amount or allowing you to skip payments. The interest rates are much higher on private student loans. You will need to make paying these off as quickly as possible a priority. If the payment amounts are too much, even with the lowered federal student loan payments, you may consider consolidating your private student loans to lengthen the amount of time you have to pay off the loan. When you consolidate your private student loan try to lock in an interest rate instead of using a variable interest rate. The shorter the term of the loan the less you will pay in interest, so try to make the payment amount manageable, but pay as much as you possibly can. Your current financial aid office offers exit counseling to help you come up with a plan to pay off your student loans. You can visit a financial counselor to help you create a budget to pay off your student loans more quickly. However, it is important to realize that most credit counseling places work primarily with consumer debt, not student loan debt. Bankruptcy rarely forgives student loan debt. You need to work quickly to reduce your debt so you can begin investing and possibly purchase a home. Once you get your first job you need to create a budget that allows you to put extra money towards any debt that you have. Your private student loans should be paid off before you start putting extra money towards your federal student loans. 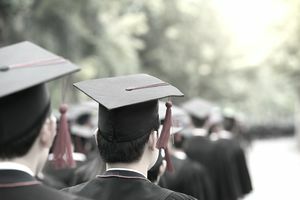 If you have amassed a large amount of student loan debt you may need to continue to live a student lifestyle until you have reduced the amount you currently owe. The amount you make once you graduate will determine just how much you have to cut back on your current lifestyle.